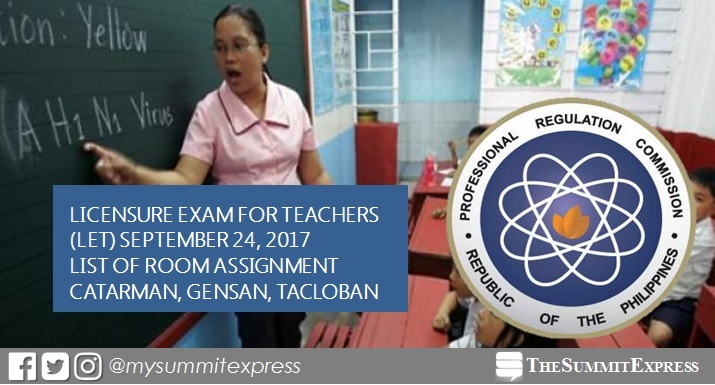 MANILA, Philippines - The complete list of room assignments for September 2017 licensure exam for teachers (LET) in Catarman (Northern Samar), General Santos and Tacloban has been released online. The Professional Regulation Commission (PRC) regional offices announced the names of qualified examinees together with the room, school and address of test center venue for the nationwide conduct of LET on Sunday, September 24. According to PRC Resolution No. 2016-1019 series of 2016, the September 2017 LET shall be conducted in Manila, All Regional Offices; Zamboanga, Bacolod, Rosales, Pangasinan, Laoag, General Santos City, and Catarman, Northern Samar. The Commission announced the designation of Mamburao, Occidental Mindoro; Calapan City, Oriental Mindoro; Odiongan, Romblon; Kidapawan Cotabato, Boac, Marinduque; Virac, Catanduanes; Puerto Princesa City, Palawaan and Masbate City as additional Testing Centers for the September 2017 BLEPT through Resolution No. 2017-1047. 1. Examinees should report before 6:30 in the morning every examination day. LATE EXAMINEES WILL NOT BE ADMITTED. 2. Bring the following: Notice of Admission (NOA), Official Receipt, pencils no. 1 or 2, black ball pens, metered-stamped window mailing envelope, long brown and long plastic envelopes. 3. CELLULAR PHONES AND OTHER ELECTRONIC GADGETS ARE STRICTLY PROHIBITED. 4. Wear the prescribed dress code. The Summit Express will also update this site for the results of September 24, 2017 LET board exam. You may also check out the official website of PRC (prc.gov.ph) for more information.